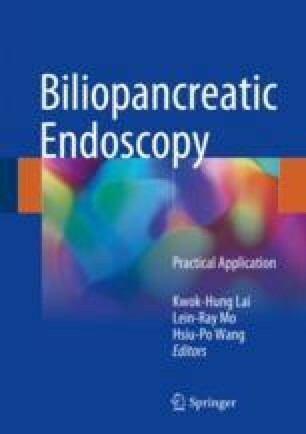 Endoscopic retrograde cholangiopancreatography (ERCP) is widespread use for the clinical management of biliopancreatic disease. Even the diagnosis of most biliopancreatic diseases can be established by noninvasive imaging modalities including computed tomography (CT scan), magnetic resonance imaging (MRI), or endoscopic ultrasonography (EUS); ERCP is still required for the study of sphincter function, observation of the intraductal lesions, acquisition of specimen for histological diagnosis, and further endoscopic treatment. ERCP is considered as an invasive procedure; the experience of endoscopists and working teams is the major factor influencing the success rate. A competent ERCP endoscopist is defined as completing a minimum of 200 procedures and achieving an overall biliary cannulation rate of at least 85% [1–3]. In the teaching hospitals, the ERCPs performed by supervised trainees were reported to be as safe as the competent ERCP endoscopists . Some special techniques such as double guidewire method, precut sphincterotomy, pancreatic stenting, or rendezvous method with EUS can increase the success rate of difficult ERCP, but the complication rate is higher than conventional methods even performed by the experts . Screening of the patients with appropriate indications, selection of suitable methods and equipment, and well preparation before the procedures are paramount for the safety and success of ERCP. Tringali A, Loperfido S, Costamagna G. Endoscopic retrograde cholangiopancreatography: indications, patient preparation and complications. http://www.uptodate.com/contents/endoscopicretrograde-cholangiopancreatography-indications-patient-preparation-and-complications.